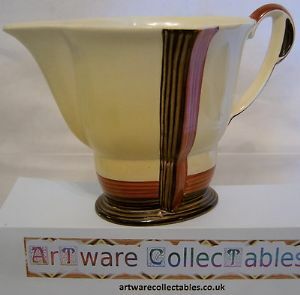 A beautiful Carlton Ware 'Vertical Stripes' Cream Jug manufactured in the 1930s. These Art Deco stylized decorations on this very scarce range of Tableware are becoming increasingly popular with collectors who are looking for a variation on the traditional Carlton Ware. The Art Deco period remains very much in vogue. This one has large vertical stripes and smaller horizontal stripes around the base, all in russet brown and red/orange colour, all set on a cream ground. It measures just about 3.5 inches (approx 9 cms) in height to the top of the handle. The shape number is 1546 and pattern number is 4083. There is no trace of crazing. The base is backstamped appropriately showing all of the above reference detail.